You registered to Dance or Volunteer…now what? Time to fundraise! 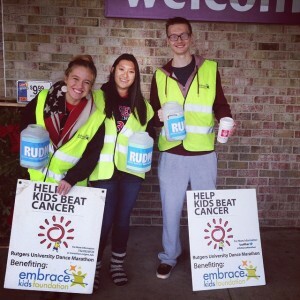 At Dance Marathon, we are committed to helping you raise money and awareness for Embrace Kids Foundation through multiple opportunities. Canning dates are available for individuals and organizations. In order to register for a canning date, users need to secure a ticket. Tickets will be available through links that are sent out closer to the canning date. Any questions can be sent to finance@marathon.rutgers.edu. Donation cans are a new fundraising opportunity where Dancers or Volunteers can sign out a can to place in a local business/restaurant. Any donations collected in the cans towards your fundraising goal. 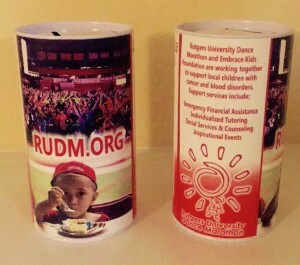 Pick up your can at the Dance Marathon office Monday-Friday, or create your own! Obtain permission to place your can at local family-owned businesses, fast food chains, local diners, or convenience stores. Follow up to monitor the progress of your can. Deposit your collections by contacting finance@marathon.rutgers.edu. Your online fundraising page is a simple way to track and ask for donations. Once you register to Dance or Volunteer, a page is automatically created. On this page you can add pictures and a custom note so family and friends can see exactly why you are raising money. Send an email to family and friends asking for donations. Post your page on Facebook and Twitter. Bring up your page at parties and holidays to make it easy for family and friends to donate. Ask for a “dare” donation. Allow your friends to dare you to do something (within reason) if they make a significant DM donation!